I have a ticket (see below for the actual ticket) on a weekend, and intend to use it to travel from St Pancras to Brighton and back. It says that it is not valid on the London Underground. Can I use it on the Overground to travel from an Overground station to Euston, transfer to St Pancras and continue my day journey, then return to St Pancras in the evening and use the return ticket to travel from Euston to another Overground station? "London Thameslink" is the joint name for the stations St Pancras International, Farringdon, City Thameslink, London Blackfriars, London Bridge and Elephant & Castle. 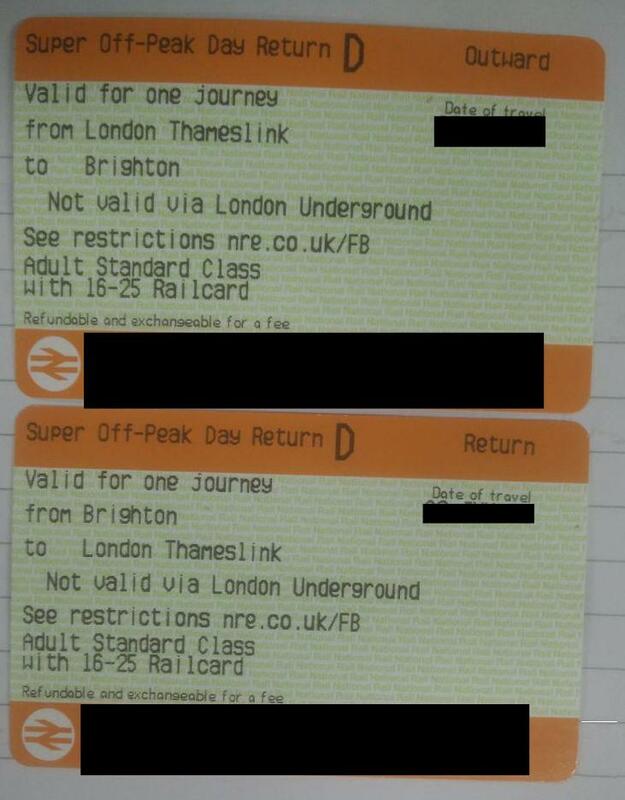 The ticket is valid for a non-Underground journey from one of these stations to Brighton and back (not necessarily to the same station from the list). The validity on London Underground is mentioned to make it clear you cannot travel from say Elephant and Castle to London Bridge on the Underground to connect to a train service there. It is not valid for any other journeys, so no, cannot be used on an Overground service to Euston. You will have to buy a separate ticket/use an oyster card for this part of your trip. Not the answer you're looking for? Browse other questions tagged london national-rail or ask your own question.